Yesterday was my dog Jake's 7th birthday. Despite being sick as hell, the rain and the cold, I took the boys out to Sauvie Island so Jake could do his favorite thing: run around on the beach. It all started one spring morning in 2006 when I looked on Craigslist and found a "6 month old Jack Russell Terrier" for sale in Camas, WA. Before I could think about it I was calling the phone number. Soon I had Jake and his interesting paperwork stating he was actually 5 months old, sold in a Vancouver mall pet store for $500 as a Jack Russell/ Chihuahua mix (he is 42 pounds now and more likely Jack Russell/heeler). He was nuts. He had SO much energy and I had to figure out how to drain it. I learned quickly that he loved other dogs and daily trips to the dog park were a huge help. His best friend at the dog park was a dog named Josie, whose owners became a couple of my favorite people (remember Mystery & Enigma?). As we tired of going to the same old dog park, we started branching out and going on "dogventures" with our other dog park friends and their dog Mays. 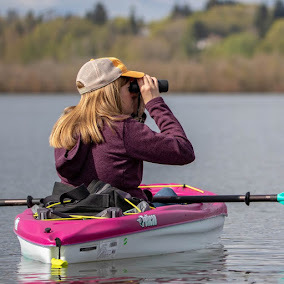 We checked out parks all over the area and my favorites became the Sandy River Delta (known by dog owners as Thousand Acres) and Kelley Point Park. In the fall of 2008 I made a rash decision to move to Philly. The only good thing about that was that I realized just how much I loved Portland, loved green spaces, and missed the nature I had grown accustomed to in the northwest. I bought a new camera while I was there, replacing the 2.1 megapixel camera I had been using before with a nice Canon powershot. I started taking a LOT of pictures. While in Philly I would visit my parents in Connecticut often. I would watch their feeders and take pictures of all the birds. I'm sure my mom told me what they were but I didn't really remember any of their names. This Osprey at Kelley Point Park, as mentioned in my "About Me" section, really captivated me. I ran home to identify it and then spent the summer watching it raise a family. Jake's energy level required near-daily adventures. It was like a birding immersion program. The more I saw the more I wanted to see, and taking pictures really helped me identify everything. So as you can see, it's really mostly Jake's fault that I bird. Sometimes I like to think about what Jake's life list would be, and how it would be bigger than a lot of people's life lists. Yep, I'm making a bumper sticker: "My dog's life list is bigger than yours." Hahaha. Seriously, though, this dog has lived. 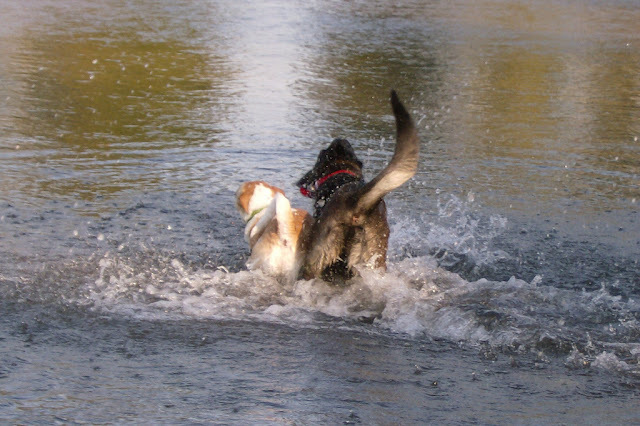 How many dogs have been to Malheur NWR AND Madera Canyon? He's dipped his toes in the Atlantic, the Pacific, Lake Mead, Puget Sound, Lake Powell... He's walked the strip in Vegas and the boardwalk in Atlantic City. He has stood on the rim of the Grand Canyon and the top of Steens Mountain. Can't wait to see what the next seven years will bring... Happy birthday little buddy!! Happy Birthday, Jake! What a wonderful life! Great post and I loved all the photos, especially the dogs. Have a great weekend, Jen! This made me cry! I never knew Jake was responsible for it all, so glad though because you are amazing at what you do and I love looking at your photos. Happy birthday, Jake! OH what a sweet tribute to Mr Jake...he is such a sweetheart and a well traveled DOGGIE, he has been more places than most grown up humans! Cheers to 7 more awesome years!! Happy Birding too! Feel better, Jen. Your posts are an inspiration! My dog has been with me about 7 yrs also, and has the same birding list as I do, too! If you guys are ever up on Whidbey Island, perhaps we'll run into you on the off-leash Double Bluff Beach - just the best! Dogs and Birds ~ Unbeatable combination. Happy Birthday Jake and feel better soon.